Volunteers play a critical role in helping organisations of all shapes and sizes thrive. We can help you to find volunteers to support your organisation. 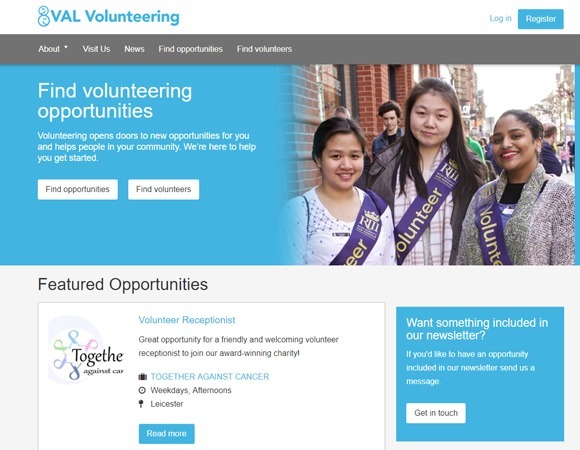 If you involve volunteers in your organisation, or if you're looking to start recruiting volunteers to support your work, you can find them on the VAL Volunteering website. It’s free to sign up as a recruiter on our site and post volunteering opportunities. Volunteers apply directly to you, giving you the freedom to screen your own applications and find the volunteers that meet your requirements. Register as a recruiter on the VAL Volunteering website and start recruiting volunteers, for free, today. If you need additional support with recruiting and managing volunteers, you can contact our Volunteering Team directly. If you want to know more about what's going on in volunteering, you can also subscribe to our monthly Involved newsletter.